is eager to start their season. Tryouts have already begun and they are looking to have their roster finalized by Thanksgiving, so they are able to start practices as soon as the season officially starts. The popularity of squash is increasing and this year they will feature both a boys’ and girls’ varsity and junior varsity teams. Due to the greater turnout this year, “There will be lots of competition for ladder spots,” Julia Pines ’18 said. The ladder spots are a system of ranking in the squash courts. With the competition increasing this year, the team has been preparing more this offseason. “In the offseason a bunch of the returning players are doing clinics at Intensity with our coach, and starting [Oct. 12] we’re having the courts open from 4-5 Saturday and Sunday for anyone interested in trying out or playing to come and try it,” Pines said. 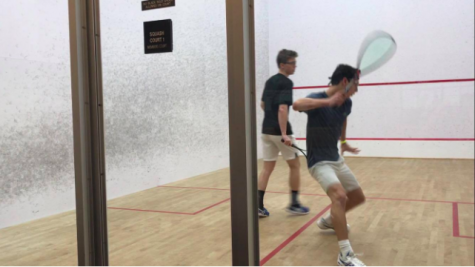 The team competes in the Fairwest League, which is the largest public high school and middle school squash league in the U.S.A., according to Fairwest Squash. The team competes among other Fairfield County Schools including, Darien High School, the Fairfield High Schools, Greenwich High School and New Canaan High School. The squash team joined the league two years ago when Kion Bruno ’18 and Mia Krishnamurthy ’18 started the team. The boys team had a 6-6 record last year with key players including Andrew Schwartz ’18, Quinn McMahon ’21 and Tyler Edwards ’20. Bruno has been putting in time outside in order to prepare for this upcoming season. “In the offseason I am training at Chelsea Piers four days a week and playing tournaments over the weekends,” Bruno said. The boys’ team opens their season this year with their highly anticipated match against Greens Farms Academy. The match does not count towards their overall record, but their high competition and close proximity presents a rivalry between the teams. Last year, Staples lost, but they are hungry for revenge this season. “Knowing how much we have improved, it will be cool to see if we can turn that loss to our local rivals into a win,” Bruno said.